None available for this vehicle. Can I use a shorter belt? Not with the belt routing they use. The belt will not make it past the other pulley without the AC pulley to pull it down. Did the clutch or compressor lock up? Not yet but it is fifteen years old and removing it is proactive. Thanks for your help. I am looking at the images below and just cannot see how it is doable, unfortunately. Unless you can remove the A/C compressor and change the idler pulley (#6 in the second image) to one with groves, there is no way to do it. Can I ask why you want to bypass it? I am assuming that there is something wrong with the compressor. 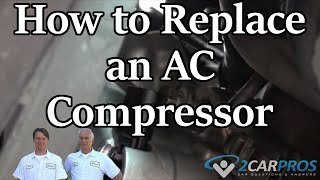 Maybe we can help you to replace the compressor easily. I would like to remove it proactively. However, I never used A/C on this vehicle. Do I not need to worry about it seizing if it is never used? I will look into the grooved pulley suggestion. Can I swap idler pulley with a grooved power steering pulley and change belt size? Usually the bearings will last a long time. I would not bother removing any of the system. Why do I say that? Do you ever use the defroster? On most newer vehicles the AC is used during the defrost mode to dry the air and prevent fogging or even icing of the interior of the windshield. So you may be running the compressor even though you do not think you are. In the event that the clutch idler bearing was to fail they usually make noise first and are not real hard to replace anyway. I never use defrost and when A/C switches on during defog I always switch it off. As Steve suggests, sometimes it is best just to leave well enough alone. Besides, that compressor is getting more use than you know. Okay, I will study automotive A/C compressors so I can appreciate all those hoses and big chunk of metal I dream of getting rid. Thanks for your help. Sorry you do not like what you are hearing from us. But as a practical matter there really is not a reason to remove the system. Can I at least get rid of all those stupid hoses? Just kidding. Can I Get Another Supertine Belt And Reroute Past The Compressor Until Summer? If So Do You Have A Diagram Of The Routing?